Tampa is known as the Cigar City due to its rich heritage to the Cigar making Industry that was so vital to Tampa's growth. Many of my family members worked in the Cigar factories in order to supplement their income from both Dairy and Beef farming. Most of the farms have given way to Developers as land prices sky rocketed. Cigar City Cattle Company began when I purchased my first herd of cattle at the age of 22. Getting into the cattle business 30 years ago seemed natural, as I grew up around my father's commercial Black Angus herd, learning the ins-and-outs of the business and the value of hard work, as well as ethics and integrity. My first herd consisted of commercial Brahman cross cows and Angus bulls. 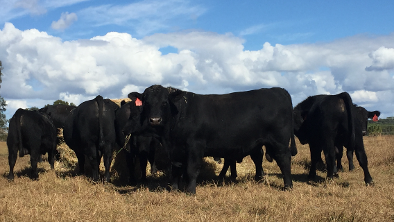 Considered an above average herd, its performance allowed me the opportunity to purchase Registered cow calf pairs and 3-N-1's from the second oldest Registered Black Angus herd in the State of Florida. The following year I made a purchase of yearling Registered Angus Heifers. I later acquired a registered Gray Brahman bull, and started a herd of True F1 Brangus. Prized by many commercial cattlemen in the South, the F1 Brangus has incredible hybrid vigor, enabling them to acclimate well to the heat, humidity and insects of Florida. Realizing the demand for better beef, Cigar City Cattle Company began acquiring and breeding some of the most progressive Angus genetics in the Breed. Our goal of producing some of the top CED, WW, YW, CW, Marb, RE,and $BEEF EPDs is in motion. We utilize current data, as well as progressive breeding and Embryo Transfer techniques to provide ranchers and breeders with some of the best Angus cattle available.